Most of the production of chlorine is used by the company itself as the raw material for the manufacture of chlorine derivatives. The rest is sold to third parties for use in chemical synthesis. In this division Ercros manufactures products that are used primarily as intermediates in other industrial processes: to purify and treat drinking and waste water; to treat and maintain swimming pool water; to bleach fabrics and paper; to produce solvents, detergents, and strippers; to manufacture printing inks and colouring; to produce compound feed and in cooling equipment, among others. 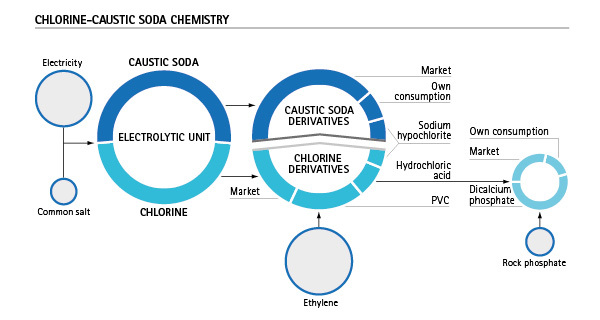 One of the chlorine derivatives that Ercros manufactures in its facilities is PVC (polyvinyl chloride). Ercros is the second largest producer in Spain of this material. Its facilities cover the entire chain for this product, including the production of the raw materials involved in its preparation such as vinyl chloride monomer (VCM) and dichloroethane (EDC). The Chlorine Derivatives Division accounts for 64% of the Ercros’ turnover and has two R & D departments located in Sabiñánigo and Monzón factories.